Our geomusical activity continues, after the launch at the Farma Valley Winter Fest (December 17, 18 and 19, 2016), the presentation at the FOSS4G conference in Genua (9-2-2017), the international webinar for Geo4all/ASPRS (7-4-2017) and the lecture at Politecnico di Milano (30-5-2017). 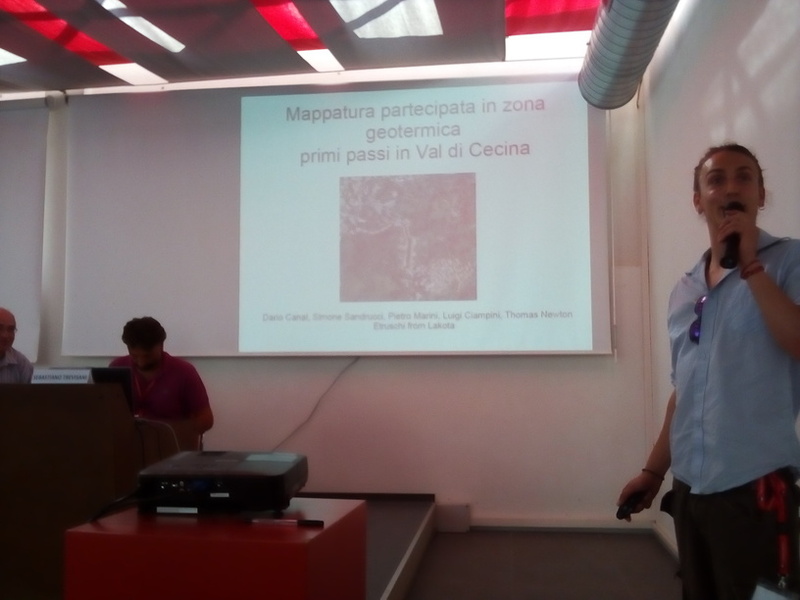 An oral presentation by Etruschi from Lakota’s, Dario Canal, on the subject of Participatory mapping in a geothermal area: first steps from the Cecina Valley. We don’t know of geologists going to contests for professional musicians…in our case we had a young professional musician and singer giving a talk in a geoscience conference (and kudos to Dario for taking up the challenge). This was not a weird experiment, since we are collaborating with the band on on participatory mapping projects, and they are actually based in an area of great interest for geology (and geothermal activities), but surely it was an unusual and stimulating presentation. Should you be interested in collaborating with the Val di Cecina participatory mapping campaign, which follows the work started in 2015 in the Farma Valley, please write to info@pibinko.org.